Situated on a quite residential street in the heart of Westminster this quirky one bedroomed flat offer the perfect haven from which to explore all the capital has to offer. Buckingham Palace, Westminster Abbey, Parliament, Tate Britain as well as the central London Parks are all within a 5-10 minute walk. Good base to explore many of London's landmarks. Soho and Theatreland 15 minute walk away. The flat has a comfortable living room and fully equipped kitchen means you can eat breakfast, cook a meal, watch TV or listen to music when you want to unwind from the hustle and bustle of the City. 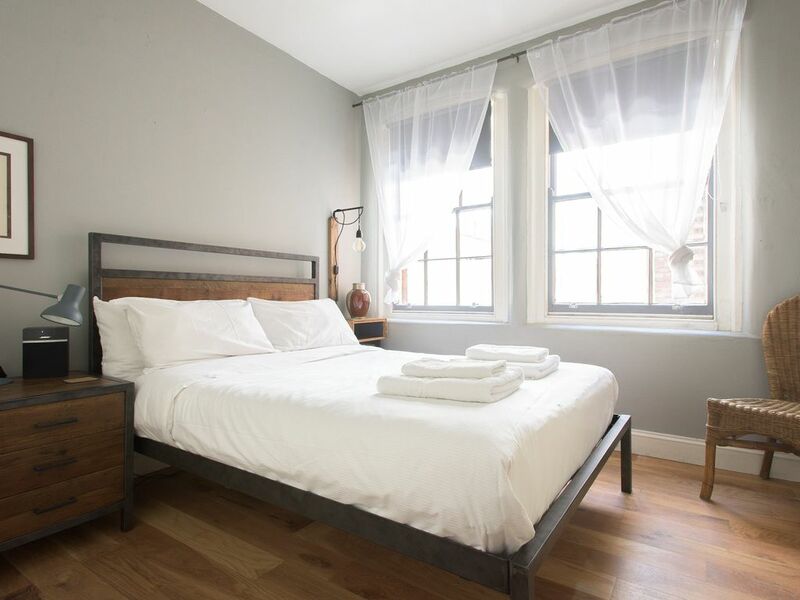 The separate bedroom offers a comfy double bed with Hypnos Mattress and plenty of places to store cloths and belongings. Very central postcode with Tate Britain, Buckingham Palace, Westminster Abbey/Big Ben, etc... at a walkable distance. For entertainment we have three thearters and a cinema within a five minute walk and the west end can be reached on foot within 15 minutes. We are also just off Victoria street with all the bars and restaurants on offer. Pimlico has a great deal of restaurants on Wilton Road (five minutes away). Being within five minutes walk of Victoria and St James Park Stations everything within central London is never more than 15 minutes away. The closest stations are Victoria and St James's Park. And Pimlico a bit further away. Tube lines are: District and Circle Lines from Victoria or St James Park (going East or West) and Victoria Line (from Victoria (going North and South)). Number 24 taken from Victoria Street heading towards Hampstead Heath. This takes you to Leicester Square. Number 38 heading towards Clapton from Victoria Station which takes you to Piccadilly and along Shaftsbury Avenue to Covent Garden. Direct link to Gatwick Airport with the Gatwick Express at Victoria Station. Heathrow Airport 50-60 minute transit with the Paddington Express and Circle Line to Victoria. We stayed for nearly a week in David's flat and enjoyed it so much! The property is central to lots of attractions and very close to Victoria Station. It has a great kitchen, a cozy living area, a full bath with washer/dryer, and a lovely bedroom (very comfortable, clean bed). It has everything you'll need for a short or long stay. (Check the cupboards before you head to the nearby grocery; past guests -including us- have left behind staples for future guests.) David was very responsive and went out of his way to accommodate our check-in/out requests. Great experience in a great location! Thank you Anne & Maurice. Looking forward to having you back for your next London holiday. The flat was great and met all of our needs. It's in the back of the building, so it was very quiet. There is a lift in the building, but the stairs made for better exercise. The location was terrific - near to Victoria Station and in the heart of the Westminster neighborhood. Thank you Greg, welcome back anytime. The property was perfect for our stay. Everything was up to date, very comfortable, extremely clean, and we felt right at home immediately. David was a great host and had someone there to meet us, even a bit early. We had a few questions during our stay and received immediate responses on how to use the Tube, etc., and also great recommendations on restaurants and other tips. The bed was very comfortable, the bath was roomy and modern, great WiFi, and comfy furniture for relaxing after a busy day of sight seeing and shopping. We didn’t cook while we were there but it would have been easy to do as the kitchen was very modern and well equipped. The location was superb, very safe and close to shops, restaurants, and Tube station. I highly recommend this flat and would love to stay here again on a return trip. Thank you Meg. Lovely to have you stayed at the flat. Great locatation, cozy and comfortable. Great location, about 3 minute walk from Victoria tube station and dozens of restaurants. Cozy, comfortable, nice usable kitchen. No street noise however somewhat at the mercy of upstairs neighbors vis-a-vis sounds from foot falls in the middle of the night, a minor inconvenience. We stayed in late November, the heating system is very comfortable and suitable to the weather. A very comfortable mattress on the bed, the kitchen was usable and complete. Very quiet neighborhood across the street from Westminster Cathedral and it's primary school (we enjoyed a Sunday afternoon concert on the spectacular Cathedral organ). We would recommend without reservations. Thank you Robert. Welcome back anytime! My husband and I really enjoyed our six days in this one bedroom right next to the Westminster Cathedral which is beautiful and all lit up at night in front. Amazingly for being so near stores and restaurants, this nice residential street and building are so quiet and it feels very safe. The Victoria station is just a couple minutes walk. The apartment was really nice, very clean and had some interesting and creative designs. It is on the third floor and there is a lift. This is a pretty small place but perfect for a single person or a couple. The bed is comfortable, the kitchen well stocked and the shower is great. The main room is a little filled with the furniture but it is comfortable. Only suggestions would be to fix one of the doors in the bedroom bureau which would not stay shut and the kitchen faucet is wobbly but works fine. Neither were a problem for us. Communication with the owner, David, was easy and he sent all the info we needed to know how to work the heat, etc. Highly recommend!